When it comes to outdoor adventures there is a whole array of things to do in France. The Gorges du Verdon is amazing for adventurous outdoor sports. The South of France abounds with water sports, and Brittany is a haven for sailors. Below are suggestions of a variety of fun activities and where to find them. For the fisherman or woman, fly fishing in France is very satisfying with fantastic streams and rivers to any fisherman’s delight. An outfitter and guide, Gourmetfly is a French company offering a choice of services. For a fee they will guide you, or send you on your own with a written guide. The website offers great photos and suggestions of places to go. Brittany France is one of the best places for sailing. Below are two well loved options. Club Nautique du Rohu offers rental or lessons in windsurfing, funboat, multihull, racing keel-boat J80 or kayaking. Sail with a skipper on a 60 foot racing boat. Live and travel on a boat with a French River Cruise. One of the most popular things to do in France during the warm weather. In the south of France alone there are 14 navigate able rivers and very popular area for other water sports. Kayak or canoe down the Gardon River. This is where the famous ancient bridge Point du Gard is. See it from the water as you paddle down the river. Below are two outfitters that will assist you. Canoe France offers boat rentals and return transportation for the Gardon River. They get great reviews. Between Montpellier and Nimes, you can access the Herault River with this well reviewed outfitter. 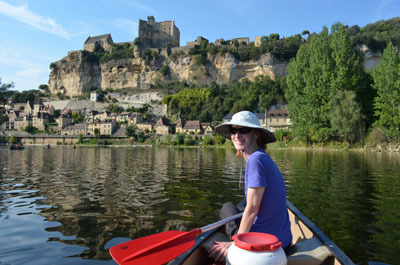 Rivers of France is a group of kayak and canoe rental companies in Southern France committed to quality. Their website offers options on many rivers of the South of France with a different outfitter for each. The site has an English language version and is easy to use. Plongee Phoceenne in Marseille offers instruction and certification. Gets very good reviews. You can take a week long French golf holiday or just play for a day. France has many award winning top notch courses. Golf is a popular sport. In the south of France there are courses with fabulous views of the Mediterranean, and in the Loire you can play next to a castle. You can even play golf just outside of Paris. This area in one of the famous places in France for its dramatic natural beauty. The gorges is as deep as 2,297 ft (700m) in some places. Besides Rock Climbing this area offers so much outdoor adventure activities. You might want to also check out White-water Rafting, Bungee jumping, Mountain biking, canoeing, walking and hilltop villages too. There are many beautiful areas to hike in France. Below are some of the national parks and nature areas ideally suited to hiking. Get ready for spectatular views, and mountain climbing and hiking. The beautiful wide sandy Normandy beaches are great for horsebacking riding and inland as well. A beautiful natural wildlife area that goes down to the Mediterranean. This area is famous for its horses and natural beauty. Horseback riding, Hiking, Camping, and Bird Watching are available. Camping Brittany is a delightful experience. You can camp right on the beach or stay at one of the attractive camping resorts. Brittany is very rural and dotted with old villages. See camping Brittany for our family favorites. Very well reviewed this place is in the Finistere which is right out on the furthest point of Brittany France with beautiful seascaped beauty. Tour de France history. Biking is a very popular sport and the tour de France is world famous. You can watch the race from the side of the road. You can also bike in France on your own.